Don Yenko, the Caroll Shelby of Chevrolet, would be pleased. Caroll Shelby gets all the glitz and glamour among fans of American muscle cars for his highly desirable Shelby Cobra and the Cobra badged Mustangs that followed, but many of these same enthusiasts scratch their heads at the name Don Yenko. Yenko was just as crazy as Shelby because he built high-powered Camaros in the 60s by breeching GM’s rule that none of its engines should exceed 6.6-liters in size, but he didn’t get as much attention as Shelby. It's a shame too given just how much the Yenko name means to diehard Camaro buffs. Capitalizing on the prestige, New Jersey-based custom car builder Special Vehicle Engineering (SVE) has just unveiled another car branded with the famous Yenko name. This time around, the Chevy in question is the Corvette Grand Sport, which has been tuned to make 800 horsepower and 750 lb-ft of torque. 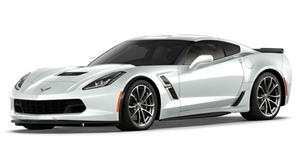 Previously, it was the Corvette Z06 that made the most horsepower, topping out at 650 ponies. The reason the Grand Sport was picked for tuning over the Z06 is that the smaller Corvette features a not-tampered-with 6.2-liter V8 engine and the aerodynamic bits off the Z06. The virgin engine allows SVE to bore it to a massive 6.8-liters, breaching the same 6.6-liter maximum that Yenko did in the 60s. SVE then bolts on a 2.9-liter twin-screw supercharger on top for the Hellcat-stomping horsepower rating. Buyers can opt to have either one of the two available Corvette Grand Sport transmissions, a 7-speed manual or an 8-speed automatic, after choosing between the coupe or convertible. While the Corvette is only a Yenko in name, SVE pays homage to the muscle car hero with colored stripes and accents as well as classic “Yenko/SC” markings on the rear quarter panels. Unfortunately, Californians hoping to buy a blast from the past to drive down Highway 1 with are out of luck. That's because the Yenko Corvette is not available in the state thanks to SVE’s reluctance to pay to have the car certified by CARB. For everyone else, expect to pay $46,000 on top of the price of a Grand Sport Vette, but be sure to save some cash for racing lessons and heightened insurance payments because even the Z06, with a 150 horsepower deficiency over the Yenko, was said to have too much power for its chassis.